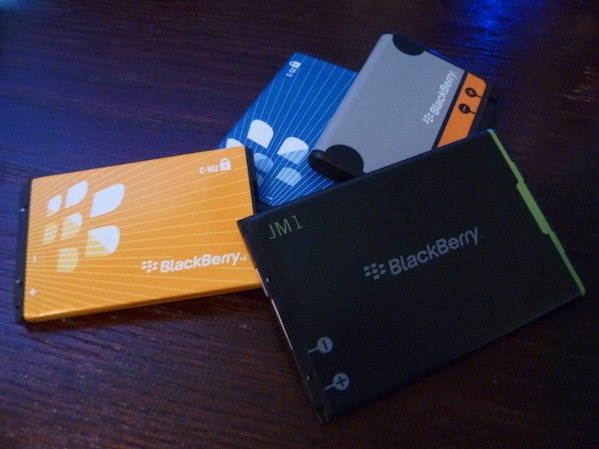 Looking to maximize your BlackBerry battery life? We've got TEN simple tricks you can use that will help to ensure you are getting the most out of your much needed battery power. While BlackBerry Smartphones have historically been known for their awesome battery life, we've seen the natural battery life take a hit on some of the new BlackBerry 7 Smartphones to hit the market. For example, on the BlackBerry Bold 9900 the battery was reduced from the predecessor Bold 9700 from a 1500mAh battery to 1230mAh. With less juice to work with and a bigger display and faster processor to power, if you're a power user you *could* be finding that your old habits put you into the low or dead battery zone before the day is done. So if you're finding yourself low on power sooner than you'd like to see and are looking to extend the battery life on your BlackBerry Bold 9900, Bold 9930 or other OS 7 device, there are plenty of settings you can tweak and battery-healthy habits you can form to get the job done. From dimming the backlight to tweaking up some network settings, a little bit goes a long way. These tips work for improving battery life on OS 6 and lower devices as well (although menus may be a bit different) so if you're looking to get the most our of your BlackBerry battery, keep reading for our top ten tricks to improve battery life on your BlackBerry Smartphone. Wifi seems to be the biggest influencer of battery life on newer devices like the Bold 9900/9930. In all of our tests and real world outings, having Wifi on and connected to a Wifi network was amazing for battery life. Using the Wifi network for data instead of the carrier network makes a HUGE difference in battery life (the radios don't have to work as hard). The Bold 9900 can get a full "work day" of use and still sit at around 80% battery life come quitting time all thanks to Wifi. However when you know you won't be using Wifi if you're out for the day or somewhere where there is no Wifi connection, you can simply turn it off to keep it from eating away at your battery. This keeps the device from searching for networks and draining the battery. Long story short - if you have a Wifi network available ... use it. If you don't ... turn it off. 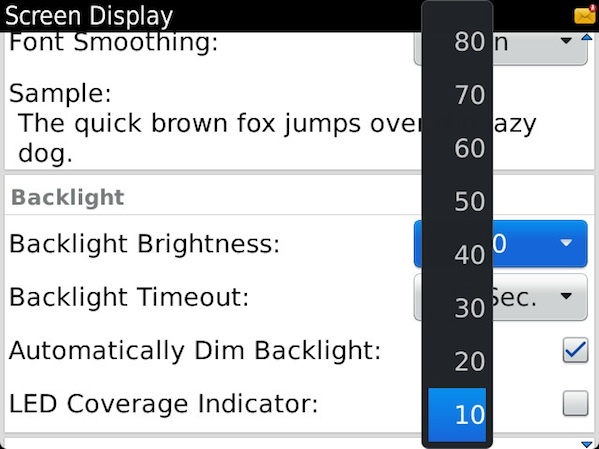 When you fire up a new device, more often than not the backlight brightness is set at 70%. This is all well and good to start as you can see the screen clearly and everything looks great. Your natural tendency to want to see things as bright as possible may have you cranking it up to 100%, however this can more quickly drain your battery as the extra juice needed to keep the screen fully lit up eats away at battery life. Turning the brightness down (even just a bit) can help immensely to extend your battery. Personally I always drop my screen brightness to 10% and have never had an issue. It may seem a bit dark at first for some, but trust me, once you adjust to it you'll never know the difference and your battery will thank you. Having the backlight timeout set to a low value keeps your screen from staying on unnecessarily when you're done doing whatever you're doing. In most cases there is no need to have the screen stay on for 2 minutes or even 1 minute after you're done using the device. I think that sticking to 20 or even leavng it at the default 30 seconds works just fine, though if you're really in need of more precious seconds of battery life you can put it all the way down to a 10 second timeout. Having a short timeout on your backlight keeps the screen from staying on too long and eating up your battery. Scroll to Backlight Timeout and change to 20 Sec. 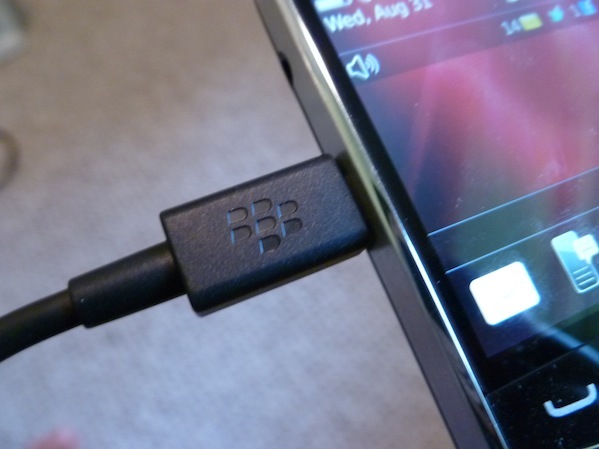 Bluetooth is a great feature of BlackBerry smartphones. It lets you connect with devices such as headsets, computers, speakers and much more. However when not in use, having Bluetooth active can slowly take away from your overall battery life. When you're not using Bluetooth it's always a good idea to just turn it off. Granted you won't be able to automatically connect to devices without turning it on again, but it's only a few clicks away so it's never too much of a hassle to fire it up again. As for Bluetooth while talking on the phone, the Crack team debates this one back and forth. Arguably you should get better BlackBerry life if you're on a call using a Bluetooth headset or Bluetooth Speakerphone (since you're now saving your BlackBerry from having to use it's microphone and speakers). Over the years we've found this can vary a bit depending, so it's something you'll want to test out with whatever Bluetooth Accessories you use. But for sure when you're not using Bluetooth, turn it off. This one not many people think of but it can also be a big help on the battery. If you happen to find yourself in an area with poor network coverage for your carrier, you can change up your settings or even turn off data completely and save yourself some precious battery bars. Sometimes when you find yourself in poor coverage it could be due to a clogged network (as happens often to the Crack Team at tradeshows or for those who are on AT&T in big cities like New York or San Francisco). If this is the case, you can access your Network Settings and change your device from 3G/H+ down to 2G. This drops your "3G data" and gets you on the slower 2G network, but also clears things up as your device won't constantly struggle to find a data connection. It may sound a bit odd, but in times of need it definitely does the trick. Depending on your situation, this could literally add a day, never mind hours, to your battery life. Alternatively, you can totally disable data on your device by simply turning data services off in this same menu. Keep in mind this will kill all data to your device, so apps, emails, BBM and the like won't be received. 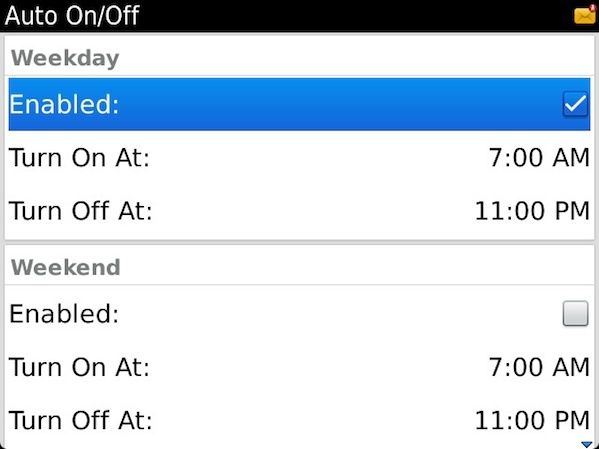 This is a simple yet not well known feature of BlackBerry Smartphones. Built into the OS is the ability to automatically turn the device on and off at given times. This is extremely useful for saving battery life as well as turning the device off when you're sleeping, in daily meetings etc. 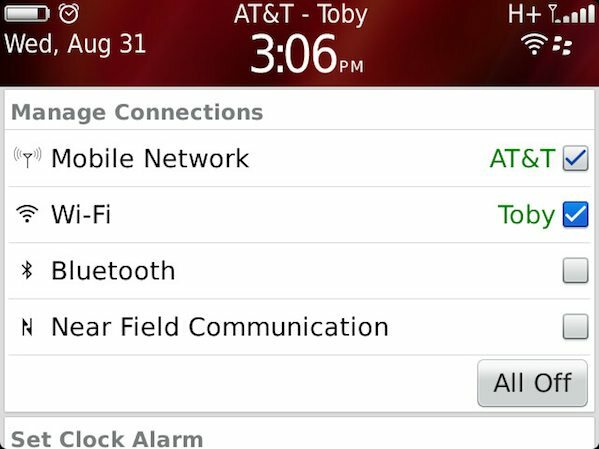 In BlackBerry 7 you can set the Auto On/Off for both weekdays and weekends and if you learn to use it correctly it can help out tremendously with your battery life. Keep in mind that this will totally shut down the device so you won't receive emails, phone calls or SMS messages as it's essentially the same as powering off the device. The good news is that if you have an alarm set before your turn on time the device will power on to sound the alarm. Also lumped in with the Auto On/Off is Bedside Mode. This nifty feature is accessed through Clock > Options and lets you automatically turn off the device LED and Radio as well as dim the screen when Bedside Mode is active. This feature lets the device remain on while not taking up any extra battery life with the device radio or LED active. The clock will be displayed and the screem dimmed, so if you don't want to worry about missing phone calls or SMS messages, this is definitely a better way to go. You can also power off the display fully in Bedside mode, further saving battery life (just hit the screen lock button once in Bedside mode). Read more on using Bedside Mode here. While locking the device is something you should do anyway (better security when you use a password) it can also help save battery life. When your device is in your pocket or purse and it gets banged around, sometimes the screen will activate when a key is pressed. 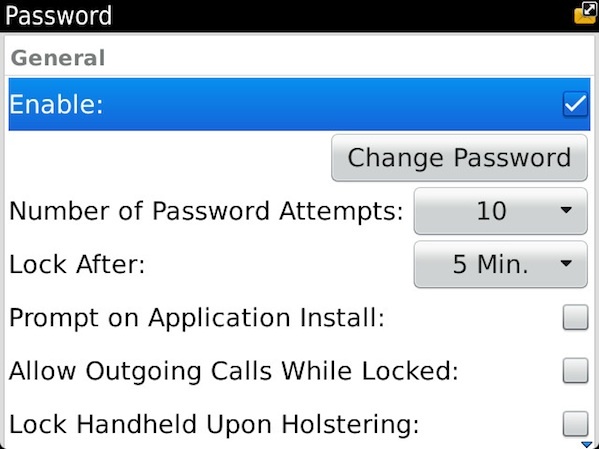 To prevent this you can either use the lock button on your device or set a device password with a timeout. This is a good practice to keep the device safe while preventing the screen from turning on when you don't want it to. You can also use one of the many BlackBerry holsters that contains a sleeper magnet - automatically putting your device to sleep when you put it in the holster. Simply closing unused apps can go a long way in helping battery life. In particular apps that constantly pull your GPS location or perfom other tasks really hinder your battery life when not in use. To easily close these apps you can use the built-in App Switcher to see what's running on your device, then close anything you aren't using. Apps like Twitter, Facebook and others that run in the background on your device can eat up precious battery life in no time. These apps constantly refresh at set intervals and slowly chip away at battery life you could be saving. 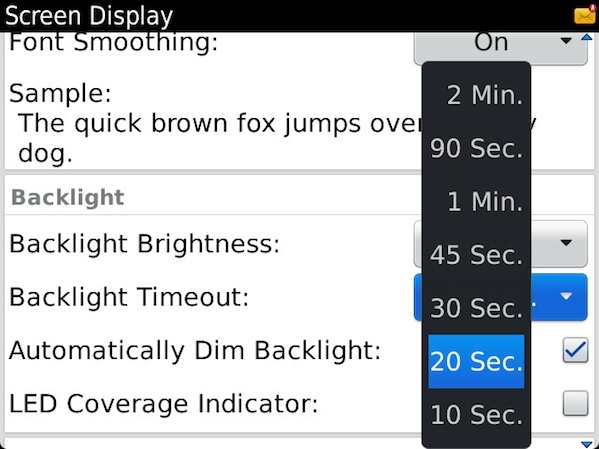 For any app that has a background refresh, you'll want to turn the refresh rate up or even off completely. 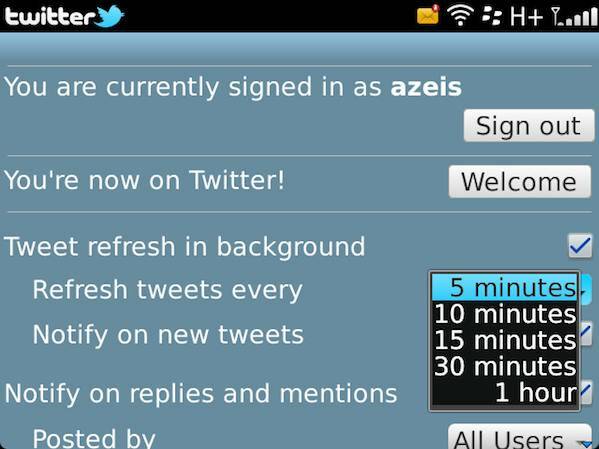 Twitter for example can be set to refresh at anywhere from 5 minutes to 1 hour. Having the app refresh every five minutes isn't the best idea if you're looking to conserve battery power, so changing it to 1 hour or even turning it off and manually refreshing as needed goes a long way. The same is the case for Facebook, Social Feeds and other apps that refresh in the background. Last but not least is the "no brainer" of the bunch. Charge your device whenever you have the chance. Be it at home or in your office with a standard wall charger or BlackBerry charging pod, in your car with a car charger or wherever you happen to be. Charging in your down time is obviously the best way to keep your battery up and running all day long. If you happen to be on the go daily and fear your device won't make it through the day, why not just carry a spare battery? This is the best way to ensure you're up and running when you need to be and will leave you worry free knowing you have an extra battery ready to roll when you hit the red. 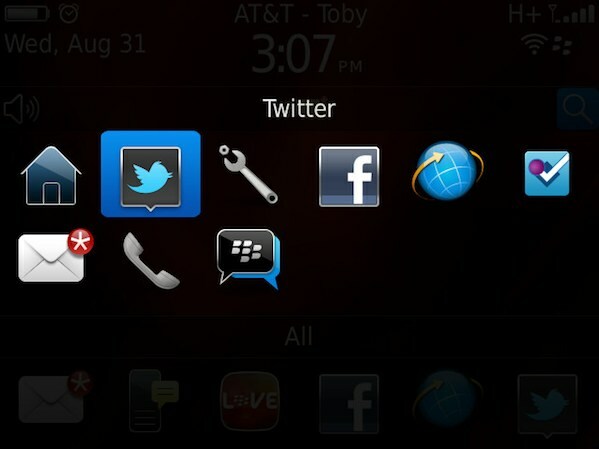 Experimenting with the tips above should help you to greatly extend the battery life of your BlackBerry Smartphone. While some of the factors above such as network coverage are not usage dependent, in general the more time you spend with the BlackBerry in your hands actually using it, the quicker the battery is going to die. If you spend hours a day watching videos on your BlackBerry or tether it to your PlayBook or laptop, you're going to eat the through the battery much quicker than if you mainly leave it your pocket or purse and pull it out when you get a BBM or email. Have any other battery saving tips? We're sure you do! If you have a good one, be sure to drop it in the comments so others can benefit from it.